Taylor Swift marked her return to awards show in true style when she graced the red carpet at the Billboard Music Awards in a dazzling cream gown. The 28-year-old pop princess stole the show in the clingy floor-length dress, adorned with feathers and intricate embroidery. Mesmerising photographers in her regal attire, Taylor also displayed her long lean legs in the thigh split gown. Lapping up the attention in the breathtaking frock, Taylor posed for photographers before entering the MGM Grand Garden Arena in Las Vegas, Nevada. Once inside the venue Taylor was seated beside fellow musicians Shawn Mendes, 19, and Camila Cabello, 21. But it was her reaction to Kelly Clarkson’s opening medley of the nominees’ songs that got people talking. 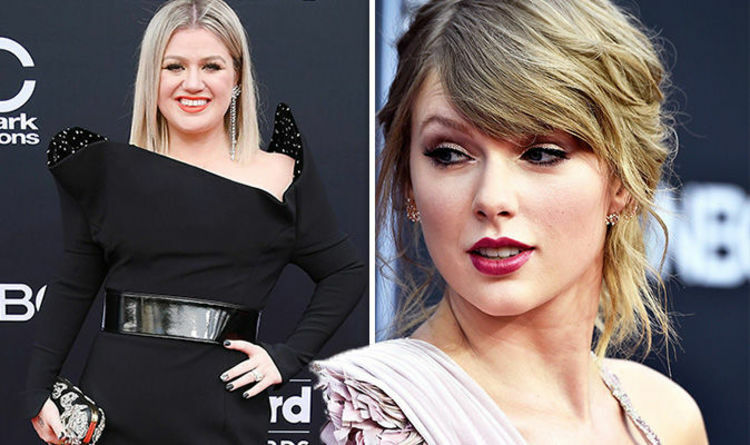 Breaking out into song at the start of the awards ceremony, Kelly Clarkson sang hits from Kendrick Lamar, Bruno Mars, Cardi B, Ed Sheeran and Khalid amongst others. However, it was Kelly’s rendition of Taylor’s track Look What You Made Me Do that provoked a hilarious reaction from Taylor herself. As The Voice coach belted out the upbeat tune, Taylor was seen rolling her eyes and staring down at her nails. Of course, it was all in jest as Taylor was also filmed singing along before breaking into a fit of laughter. Naturally, Taylor’s legion of loyal fans were quick to comment on the comical moment, with many taking to Twitter to share their thoughts. During the awards show Kelly also made a speech about gun violence following the Santa Fe mass shooting, last week. Addressing the star-studded crowd, Kelly began: “I’m a Texas girl and my home state has had so much heartbreak over the past year.